Jurgen Klopp has agreed to become the new manager of Liverpool FC on a three-year deal. Liverpool FC hospitality guests will be able to see the German’s first game in charge at Anfield as Liverpool take on Rubin Kazan in the UEFA Europa League on Thursday 22nd October. The club took the decision to part company with Brendan Rodgers on Sunday, after a solid but unspectacular start to the season. Since then Fenway Sports Group have moved quickly to secure the services of Klopp, who they have been linked with several times in the past. The 48-year-old has been out of football since leaving Borussia Dortmund, a club he guided to two Bundesliga titles and the 2013 UEFA Champions League final, where they were narrowly beaten by rivals Bayern Munich. The side he built was one of the most entertaining and popular sides in Europe featuring players such as Robert Lewandoski, Mario Gotze and Mats Hummels. Klopp will bring former assistants Zeljko Buvac and Peter Krawietz to Anfield as part of his coaching staff. 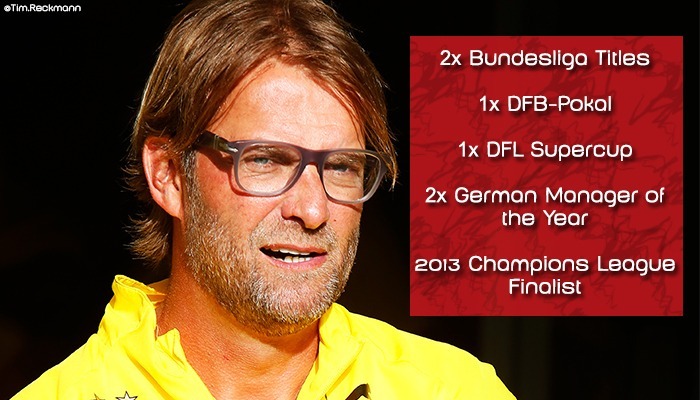 Bosnian Buvac, 54, and German Krawietz, 43, were key members of Klopp’s backroom team during his time at Dortmund. Franz Beckenbauer, who won the World Cup with West Germany as both player and manager, believes Klopp and Liverpool will be a “good couple”. Please see our Liverpool FC hospitality page for more information on how to see Klopp’s first match at Anfield in VIP style.